Experience luxury resort living in your 5th floor, deluxe 2 bedroom (1 queen, 1 King), 2 bath, air-conditioned, waterfront/beachfront condo set in a tropical garden paradise with a sweeping balcony overlooking the whitest and finest sand beach in the Gulf of Mexico. Your vacation hide-a-way is decorated in authentic island tradition with fully equipped and remodeled modern kitchen with granite counter tops, living room and dining room. For your convenience there is a phone, three color TV's with cable, DVD player and stereo. Covered outside parking is also provided. Laundry facilities are provided on all floors. Crescent Arms is a quiet, beach front, high rise condominium building located on Siesta Key Beach on the Gulf of Mexico. 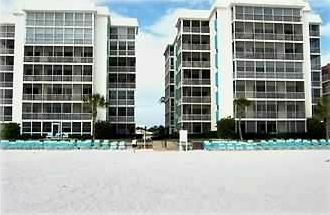 Our unit is corner beach/Gulf front and has a panoramic view of the Gulf and beach. You can walk the white powdery sand beach to the village of Siesta Key and enjoy the shops, cafes and wonderful restaurants or you can stay at the condo and enjoy the view. Relax in the heated pool after a day of strolling on the pristine, white sandy beach. Our gulf waters are emerald green and crystal clear, and our snow white sandy beaches only magnify its beauty. Our sunsets are just the beginning of a gorgeous evening, or the start of an exciting nightlife with restaurants and other attractions nearby. Siesta Key is a little piece of heaven. Early morning hours you will see dolphins playing in the gulf right from your lanai. Our unit is both beautiful and comfortable. Enjoy all the comforts of home while being right on the beach. We are located minutes from the Siesta Village with shops and restaurants. We are also near St. Armand's Circle with its trendy shopping. Sarasota has all the social and cultural attractions you could desire. One designated covered parking space per unit. Additional "visitor" parking spaces are available. Screened in. Overlooks beach and Gulf. Table and chairs. Lamp. Lounge chair. Pool is for Crescent Arms Owners and Guests only. Not shared by surrounding Condos or hotels. We stayed here for my sons spring break and had a wonderful time. The unit is clean an comfortable with lots of amenities. the entire complex is well taken care of and makes you feel like you are somewhere special. Its within walking distance to several restaurants. The beach is incredible. The owner communication was quick. We would stay here again. very nice unit nice part of the beach perfect sunsets and quiet. My husband and I really enjoyed our stay at Crescent Arms. The owners of unit 504N are very pleasant and helpful. Nice view of the gulf and the dolphins, beautiful sunsets, screened balcony overlooking the beach, comfortable and homey, very clean, well stocked with dishes, glassware, pots, pans, etc, plenty of bath & beach towels, nice bed linens, convenient covered parking. Great place to kick back and relax. We vacationed in early January, so the high temperatures were low to mid 70’s – perfect for having the screened windows open to let the gulf breezes in! Crescent Arms is an older building, but well maintained. Favorite restaurants: Dutch Valley (South Tamiami Trail), Yoder’s (Bahia Vista Street) and Siesta Key Oyster Bar (Ocean Blvd, Siesta Key). Hope we have the opportunity to vacation here again someday. We enjoyed staying in this oceanfront condo. It is a bit outdated and old but has everything you need except umbrellas and beach chairs. What we did not like: we are staying in Crescent Arms for several years, but this year showed us that we need to look for a different resort next year. We were staying during red tide this year which was bringing a lot of dead fish to the sand shore everyday. I understand this is a natural occurrence and they can't control. But the property NEVER cared about cleaning their beach portion. Tons of dead stinky fish with flies around and seaweed was on the sun for days. Why is it so hard to clean the beach every morning? It was so nasty and dangerous for children. Also, the hallways near elevators and inside elevator were always dirty... At 8 pm property maintenance was grabbing the chairs we were sitting on when watching sun set, and since we didn't have chairs in the unit I was forced to stand while pregnant. If it wasn't for the unit view the property would get - 1 star review. This is not just my opinion but also of three more families that were staying in Crescent Arms. We really enjoyed our stay. The location on the beach was perfect. The condo was comfortable and has a great view. The beach is awesome. Nice for walking or just lounging by the water. The sunsets were spectacular. It’s convenient to the Siesta village with many good restaurants and shops. We can’t wait to come back! This condo has a great view, beautiful beach, and convenient amenities. It was perfect for our family vacation for the week. I can't wait to come back! We are so happy that you enjoyed your stay! Thank you for staying with us and we hope to see you in the future. Holiday rates apply the week prior to, the week of and the week following Easter, 4th of July and Christmas. Contact us for holiday rates. Rentals are from Saturday to Saturday.